Country legend Little Jimmy Dickens has died aged 94. Jimmy Dickens’ spokeswoman Jessie Schmidt said the singer died on January 2 of cardiac arrest after suffering a stroke on Christmas Day. His novelty songs, including May the Bird of Paradise Fly Up Your Nose, earned him a spot in the Country Music Hall of Fame in 1983. 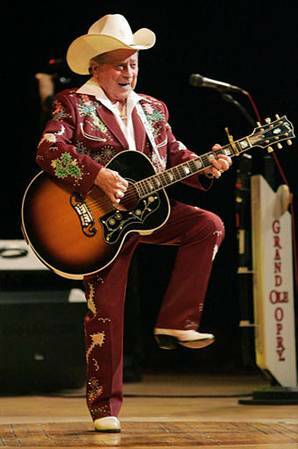 Jimmy Dickens is also credited with introducing rhinestone suits to country music. He was the oldest member of the Grand Ole Opry, a weekly music concert broadcast live on radio from Nashville, Tennessee. Little Jimmy Dickens had performed almost continuously on the show since 1948, making his last performance on December 20 to celebrate his 94th birthday. Pete Fisher, vice-president of the Grand Ole Opry House in Nashville, said the show “did not have a better friend than Little Jimmy Dickens”. “He was a one-of-a-kind entertainer and a great soul whose spirit will live on for years to come,” he added. Despite being just 4ft 11in tall, Jimmy Dickens said he had never been self-conscious about his height. “It’s been very good for me. I’ve made fun of it, and get a laugh here and there,” he said in a 2009 interview.